Old dog aggression! What an appalling thought! Worried that your older dog has suddenly turned aggressive? It’s really unthinkable that a normally gentle, calm and loving pawsome oldie has suddenly become aggressive and on guard. Worse still, the used-to-be friendly oldie is suddenly growling at people, baring her teeth, or actually trying to bite someone. Many people associate aggression, teeth baring and biting with canine behavioral problems. But how can you explain the reason why a normally gentle old dog has a sudden behavioral change? When an older dog suddenly becomes aggressive, she is not suddenly being possessed by demons, or has just turned “bad” out of the blue. More often than not, the dog is suffering from some physical health problem. There are of course a lot of health problems that may change an otherwise angelic dog into a bit of a devil. Any health problems that cause pain could turn a gentle golden oldie into an aggressive teeth-baring hound. In older dogs, problems such as joint pain and osteoarthritis top the list in terms of pain-inducing. Watch out for other symptoms such as lameness, difficulty getting up, reluctance to walk or play, and so on. Cancer is another terrible disease that causes pain to our golden oldies. Brain tumors can cause headaches, bone cancer in the limp can cause joint pain, etc. This problem affects many older dogs – mine included – and can be difficult to diagnose, due to its varied symptoms. A form of hypothyroidism is caused by an autoimmune disease (autoimmune thyroiditis). At the onset of this form of hypothyroidism, some dogs may show signs of aggression. Other symptoms of hypothyroidism to watch out for include weight gain, hair loss, chronic skin and/or ear infections, cold intolerance, and joint pain. About 50% of dogs over the age of ten will show some symptoms of cognitive dysfunction, which is basically doggie Alzheimer’s. They may have feel confused due to memory loss, and disoriented even in their own home. They may also have problem recognizing and remembering their own family members. 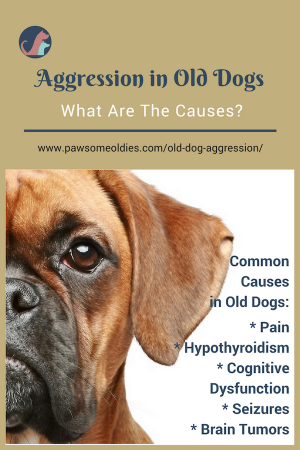 All these conditions may cause an old dog to become aggressive from time to time. Some dogs may become aggressive just before or after an episode of a seizure attack. Seizures in older dogs can be caused by a number of health issues, such as liver disease, kidney disease, brain tumors, diabetes. Brain tumors is also a common health problem in older dogs. In fact, it is believed that about 95% of dogs over the age of 7 have some form of brain tumor! Brain tumors can cause a dog to become aggressive. 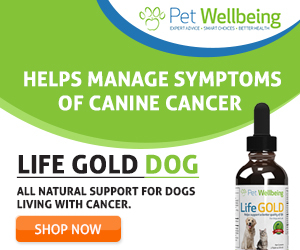 They can also alter the dog’s mental status with symptoms such as irritability, confusion, increased barking or whining, trouble seeing, excessive circling and a decreased appetite. Encephalitis (brain inflammation) – usually caused by bacterial or viral infections such as distemper or rabies. 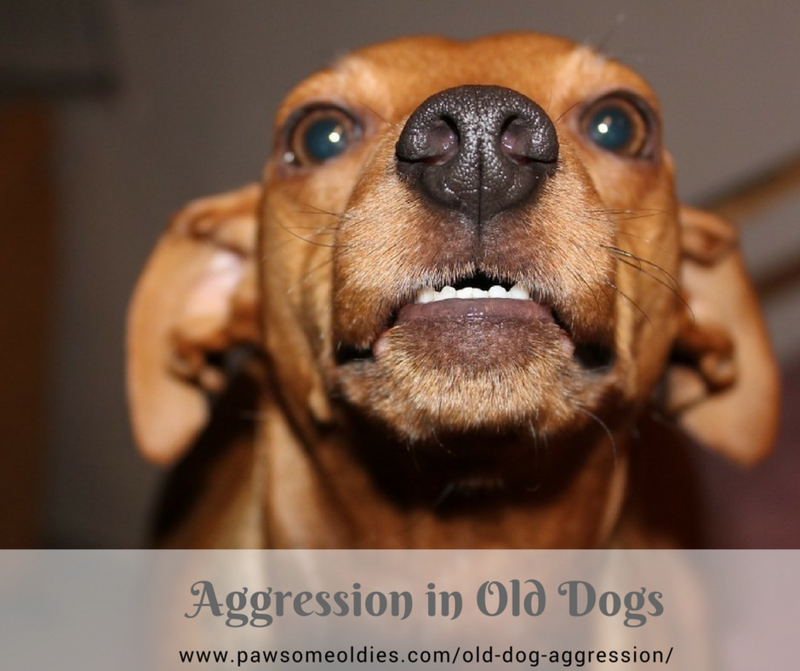 If a well-trained, gentle old dog has suddenly become aggressive, don’t just write it off as the dog turning “grumpy” due to old age, or that the dog is “bad”. Take your oldie in for a thorough physical examination, and you may be surprised that your dog’s aggression might be caused by an underlying health problem. Dogs are usually more stoic than we humans, and they can endure pain much better than we do. But if they are in pain, very often they don’t want to be touched, and if you touch him in the wrong way, don’t be surprised that you’d be greeted with a growl, or even a bite! 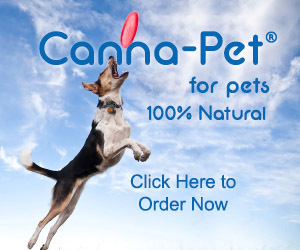 Use calming herbs such as chamomile and lemon balm to relax an aggressive dog. The easiest way is to make an herbal tea using one of the above herbs. Add the tea to the dog’s drinking water or food. 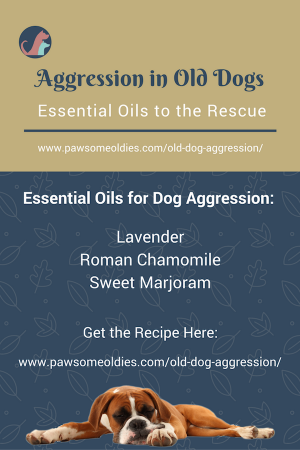 You may also consider using essential oils to help calm the dog. Oils that are calming to the central nervous system can greatly take the edge off a grumpy and snappy dog. This is the “stock bottle” of the blend. Shake to mix well. Put 4 drops of the blend on a bandanna and tie it around your dog’s neck. Add another 4 drops when the scent starts to fade. If you have a diffuser, you can also diffuse this blend in the house. Add about 6-8 drops of the blend to the diffuser and let it run for 30 minutes. Diffuse 2-3 times a day.